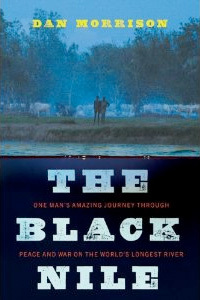 While the The Black Nile‘s subtitle boasts, “One Man’s Amazing Journey…”, a cliched line that probably should be forbidden from any future use, it is nonetheless quite accurate. Tracing the waters of the Nile from Uganda to Egypt, Morrison brings us on a journey not only across thousands of miles of Africa but also through a vast diversity of peoples and their rich and often troubled history. Weaving recent and historical events with the story of his own journey he provides an unique window onto a part of the world all too easily and often ignored. Furthermore, he casts light onto the diverse forces at play behind the conflicts that occasionally make headlines in Western newspapers. What many often portray in simplistic terms as strife between Christianity and Islam, Morrison exposes as complex and fluid allegiances and schisms. Often these are less about religious differences and more about the dynamics between the wealthy and poor, those in power and those outside, competing tribes and families, and other fault lines. The book’s core however is really a travelogue, and it moves at a swift and compelling pace. The first half of the book focused largely on the interplay between Morrison and a long-time friend who has joined him on the first leg of the journey. During his recounting of their procession up the Nile he delves into their personal histories, the author’s work as a journalist stringer and his friend’s easy life working in a resort in the United States and frequent trips to the bottom of a bottle. Unable to get a visa into Sudan, and burnt-out from the oppressive heat and relentless insects, his friend leaves Morrison midway into the narrative. Once alone, Morrison spends more time examining the people he meets, the history of the places he visits, and on his own reactions to the situations he encounters. The narration is occasionally gritty, making the rugged, unpredictable, and often sad lives of the people he meets tangible. Sometimes this tangibility is off-putting, reducing people to the mere the functions of their bodies. More often however the realism of the situation stands in contrast to these people’s humble perseverance. Simple dichotomies, between good and bad, friends and enemies are turned on their heads when presumed enemies are gracious and welcoming. There are no simple answers in the book. The alliances he examines are constantly reshaped and reevaluated. The landscape similarly is in constant flux, changed by logging, droughts, and streams of garbage. Massive dams threaten rich farmland and traditional ways of life, while bringing much needed electricity and development to impoverished towns and cities. This book raises questions, answers a few of them, and leaves a lasting impression.